Scotland serves up the first not-for-profit tea company in the UK that gives 100% of its profits to some amazing social causes. Startups caught up with James Stewart to hear all about how they do it. 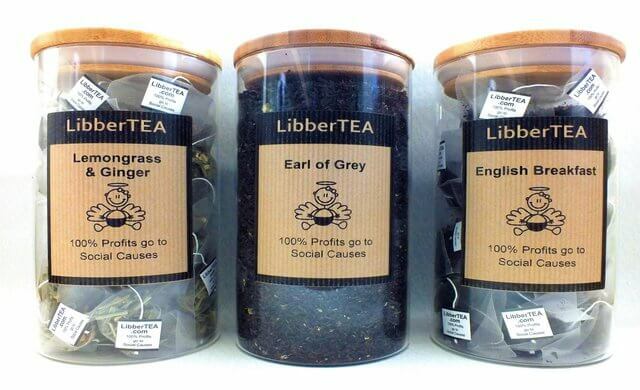 LibberTEA, a combination of the words ‘Liberate’ and ‘Tea’ is a Scottish loose leaf tea company that makes something extraordinary out of something ordinary. As a not-for-profit limited social enterprise, LibberTEA gives 100% of profits to various social causes with street homelessness, mental health, domestic abuse, clean water and animal welfare being the primary social causes. Although LibberTEA is the newest loose leaf tea business in a jungle of already well-established tea companies, we hope our certified social enterprise tea business with a diverse range of over 35 luxury loose leaf teas, branded eco-friendly pyramid tea bags and teaware range will persuade tea-lovers and foodservice businesses from across the UK to buy from us instead of their current tea supplier. I just combined a genuine passion for tea with a lifelong work ethos that helps others to create a tea business with a difference. How did you know there was a market for it? Warren Buffet said don’t waste time trying to reinvent the wheel, take something with a proven track record then make it better/different. So, that is what I did. Tea sells, so I combined it with being a social enterprise, the first to give all its profits to social causes. What were you doing before starting up? I have been a nurse for almost 20 years and latterly agency nursing. I have, but never had the depth of confidence and esteem that I initially believed was required. I realise now though that there is no minimum criteria to running your own business, just a desire to do something which will eventually snowball into something special. How did you raise the money? I used my savings – I had been planning the business for a few years beforehand so managed to save to finance my start-up. We use the standard ecommerce business model, direct marketing strategies such as trade shows and marketing to foodservice wholesale/retail for revenue streams. What challenges have you faced and how have you overcome them? Visibility and generally getting the word out about our social enterprise and our social mission was difficult. Working with Business Gateway and using the advice on Startups proved helpful in marketing our company. What was your first big breakthrough? Having Scottish crime write Val McDermid give our social enterprise a shout out on her Twitter page was awesome. What advice would you give to budding entrepreneurs? It’s better to regret the things you did do in life than regret the things you didn’t do – so follow your dreams! Where do you want to be in five years’ time? I would like LibberTEA to be the main foodservice supplier of tea to the majority of medium/large Scottish hotels as well as foodservice areas in general, then eventually in the rest of the UK. Have you started a business in the last three months? Answer these questions for the chance to be featured on our Just Started channel!